On Thanksgiving Day, on our way to the Grand Canyon, we stopped at a scenic viewpoint where a few Native Americans had set up stands to sell their handmade wares. Heather had found a necklace as a gift for someone, but she thought it might be too small. This woman graciously took the time to restring the entire piece into something a bit longer. It would have taken me about an hour to do what she did in 5 minutes! It was really fascinating to hear a bit of her story; what a life. Great B&W, man, that takes some concentration & she's doing it so easily! She looks like she has a lot of charm and history to share with the people. Beautifully captured shot; a true artist at work. Great capture! I like your composition and the B&W processing. Neat. It ain't the jewelry business we see on TV. The B&W presentation tells the story. Well done. beautiful tones and contrasts and a lovely story. Terrific shot! Have you made the trip to Canyon de Chelly or Chaco Canyon? I think you might enjoy them. I love handmade crafts. Great shot of the artist! What a life indeed, and what a beautiful black and white photo of this beautiful woman. @aikiuser Don't leave home for those places without your momm. @aikimomm I tried to get her to come this time, but... Next time for sure--perhaps for the 70/50 celebration?! Oh I love the details and processing! 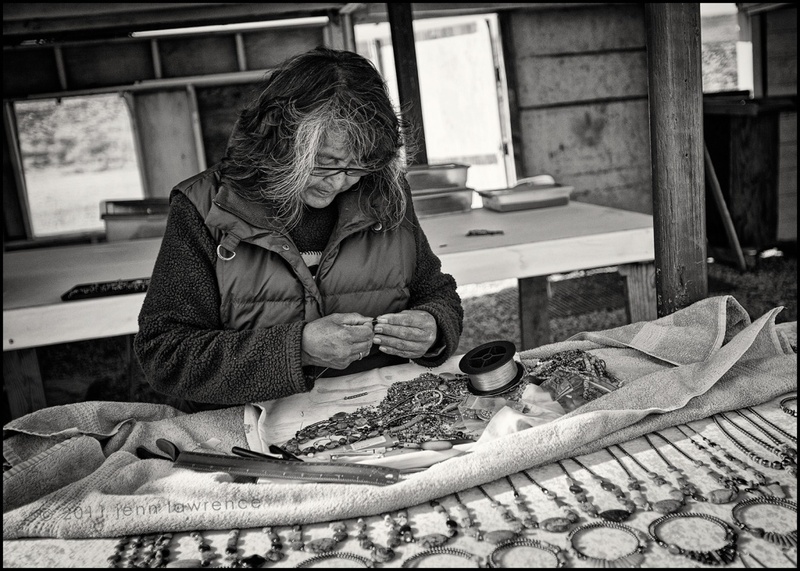 Wonderful capture of this lady doing her beading! Love it in B&W! love the b&w and composition. @nikkers Thnka you, Nikkers!!! Here's hoping your New Year is the best ever! Sorry I've been so absent for a month or so. Once I finished my first year here, I let other priorities take over my life. I may end up actually leaving 365 in order to focus more on my woefully outdated web and Flickr site. But I'll let ya know! @mikhasus THANK YOU ! ! ! Sorry it's taken me so long to respond. I've been rather absent here for a month and in fact may leave all together to focus on my terribly outdated web and Flickr sites. Who knows, maybe I'll get inspired here once again. HAPPY NEW YEAR ! ! ! @aikiuser . hey there lady.. hope all is well , and life goes on.. I do hope that we will be able to catch up with each other when Im down in LA in March/ April. but if not then another time. I have a flickr account so let me know so I can follow you on there.. lol yes Im a true stalker.. :) night night lady.. sweet dreams.. This is beaut! Very nt Geo-ish. I drove from the GC to Page, AZ a few months ago and saw plenty of these roadside stalls...I wished I culd have bought something from them..
Beautiful shot. Love it in black and white but those necklaces in the fore look fabby and I would bet they are really colourful. Wow! I missed this one during my absence. So amazing Jen! You really have a gift. @maggie2 THANKS ! ! !